From The Earth: Blog: What will you get Mom for Mother's Day? It is that time of year again - Mother's Day. For the many amazing moms who have raised us, selflessly sacrificing their time and energy, what do you get them to show them how much they are appreciated? That is a tough question with no simple answer, but at From The Earth we do have a few fair trade gift suggestions for you based on who your Mother's are and a special discount on our fair trade jewellery. Is your Mom a Kitchen Goddess? 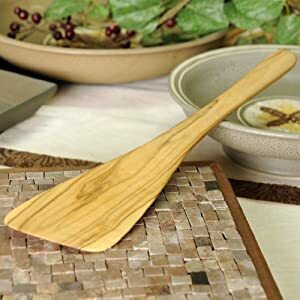 Then try our Hand-Carved Olive Wood Angled Spatula. This is just one of our many hand-carved olive wood kitchen items available on Amazon UK. Natural durability and anti-bacterial properties make olive wood perfect for the kitchen. Is your Mom a Fashionista? 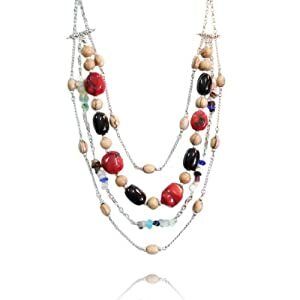 Then try our Cascading Stone Multi-Tiered Necklace. This piece of jewellery is sure to go with any ensemble. If this is the best mom gift idea for you, then you are in luck. Here is a coupon for 10% off any From The Earth jewellery item on Amazon UK: ILOVEMOM. Is your Mom a Whimsical Woman? 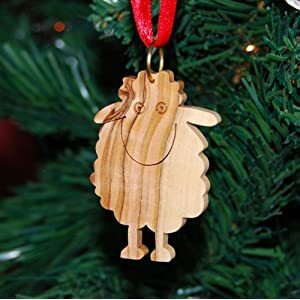 Then try our Hand Carved Olive Wood Sheep Ornament, which is perfect for use as a window cling. This cute little guy also comes as a magnet and a key chain. All are hand-carved and support fair trade in the Middle East. Is your Mom the best person in the world? 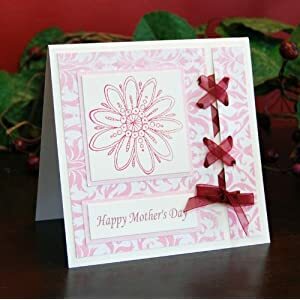 Then make sure she's knows it by not forgetting to get her a handmade card, a gift, and a little bit of your time this Mother's Day.